Can this design be saved? This is a UFO I’m trying to finish – a faded pink linen tea towel which came with a stamped design. I think this is a very uninspired design. 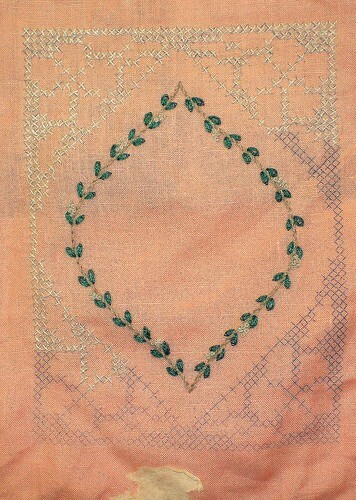 The center is stem stitch, with chain stitch leaves. I’ve added in some French knot flowers. The outside is cross stitch. Here’s a closer view of the design. The cross stitch is in off-white – difficult to see clearly in the image. This isn’t something I’d chose, but since it is taking up room in the closet, I want to finish it. Any ideas how to improve it? One thought was to add a border around the outside of the cross stitch area in green, but that doesn’t really grab me. Another idea is to weave more stem/leaves through the cross stitch, but that seems a lot of effort for a piece that I’m not crazy about. I’ll have to soak off the remnants of a label at the bottom.